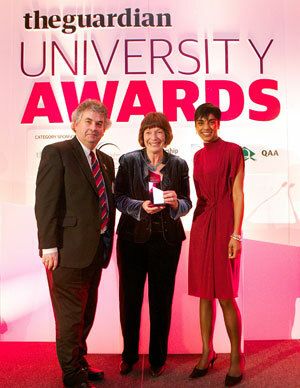 The University of Wales Trinity Saint David won the award for the Sustainability project in the inaugural Guardian University Awards at a ceremony in February 2013. The victorious project, The Institute for Sustainable Practice, Innovation and Resource Effectiveness (INSPIRE) led by Jane Davidson (former Welsh Government Minister for Education and Environment), was launched in 2012 to embed sustainability across the institution through its curriculum, campus, community and culture with a view of producing globally aware and responsible graduates. Leeds Metropolitan University was the runner-up in this category for its Zero Waste to Landfill project. 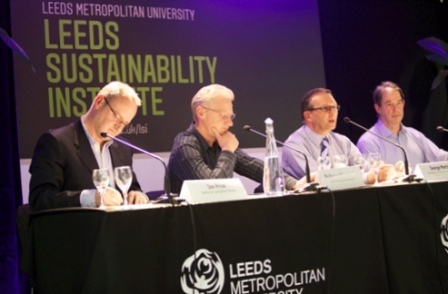 Leeds Metropolitan University launched the Leeds Sustainability Institute on 30 March 2012. Jonathon Porritt, founder of Forum for the Future, delivered the keynote address at the launch. The institute aims to tackle the challenges of creating more sustainable places, communities and economies to enable society and its infrastructure to become sustainable. Its core themes are People and Places, Infrastructure, Buildings and the Environment, Business Practice, Energy, Design and Ecological Engineering, and Information and Communication Technologies.